2- With a pot on medium high heat, add oil. When the oil is hot, stir in the marinated meat. Let brown for 5 minutes, stirring occasionally. 3-Reduce heat to medium. Add the rinsed beans, cumin, the green chilies if you are using them and chopped vegetables and let cook for 10 minutes, stirring occasionally. 4- Add the chicken broth and reduce heat to simmer for 20 minutes. 5- Mix in frozen corn and sour cream right before turning the heat off. 6- Serve warm with any fixings you want! I used some cilantro and green onions with a few tortilla chips on the side. So technically, it's more cream than white but it was definitely one of the more delicious soups I've made. Very thick and creamy too. With the beans and turkey, it was quite filling! This time, I just used sour cream. Next time I'm going to try using some greek yogurt and sour cream mixed so that it will be just a bit healthier and maybe add a bit more veggies. This sounds so good! I'm part of a freezer meal club. This would be perfect! Looks absolutely delicious! And I love that there are mushrooms in there! That looks really good, I'll have to try it! Sounds delicious! 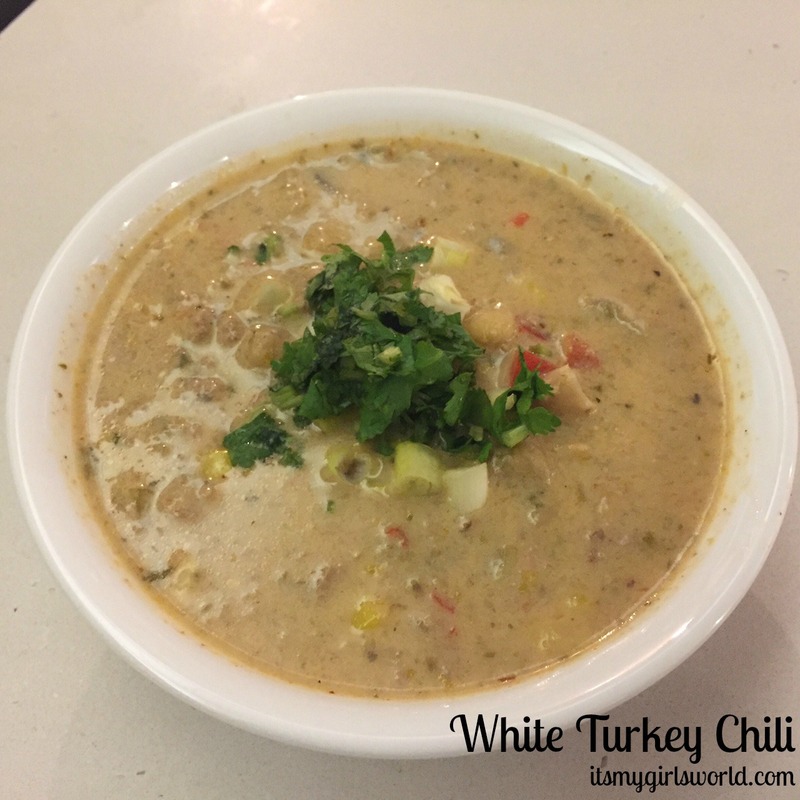 I haven't tried anything like it but I guess the lack of using red beans and the sour cream make it white chili? Either way, I'm a fan! Perfect! I have "white chicken chili" on my menu for tomorrow night but have never made it and really didn't know where to start. This looks delicious! Pinned.